Year 2 student Scarlett Harrison with her artwork Crazy Dream (top left). 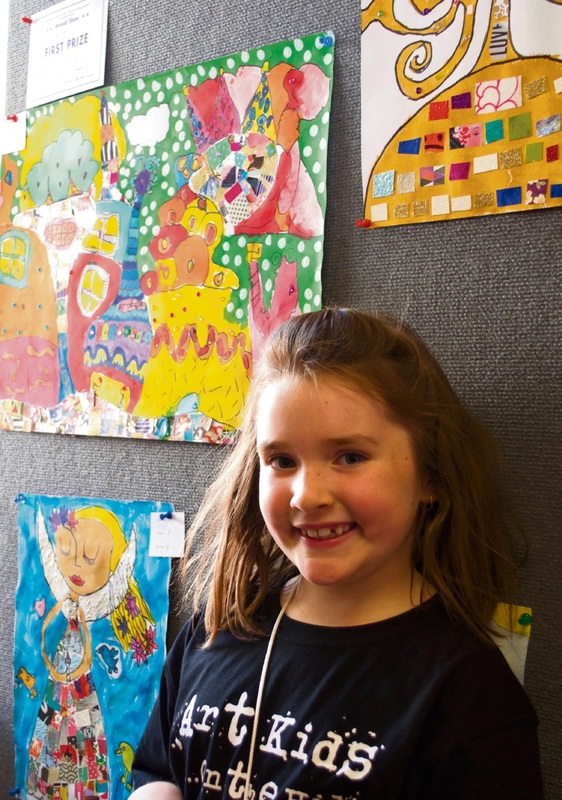 LESMURDIE six-year-old Scarlett Harrison has been shortlisted in the 2017 Shaun Tan Award for Young Artists. The Falls Road Primary School Year 2 students’ work Crazy Dream is among the top 10 chosen for the lower primary category out of 1235 entries across WA. Scarlett said she her mixed media artwork was inspired by the paintings and architecture of Antoni Gaudi, which she had been studying in art class. “I like Gaudi because he puts a lot of detail and colour into his work and I like crazy colours too,” she said. She recently won a best exhibit award at the Kalamunda Show for the second year and received awards in every art category for her age group. The award encourages creativity and imagination and gives WA school students the opportunity to present their creations in visual arts. Scarlett’s work will be on display at the Subiaco Library from July 10 to August 6.